The Funky Felter: Fabulous New Traditional Feltmakers - well, they're new to me at least! Wonderful Wet Felted Creations! Fabulous New Traditional Feltmakers - well, they're new to me at least! Wonderful Wet Felted Creations! In today's post, I wanted to share a few traditional feltmakers that I've come across. I know that they are probably not new, or beginners even, because of the great quality of their work, but they are new to me. I find their felted creations inspiring and hope that you do too. 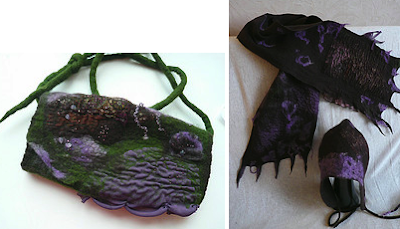 Enchanted Earth (TheFeltElf on Etsy) has beautiful scarves. They are very organic and natural looking - almost like a series of tree leaves. The color combinations are also beautiful. I think that they'd drape wonderfully on any body type. Please visit Enchanted Earth's main website for more eye-catching photos. Feltasy (the same name on Etsy) has a large variety of clothing and accessories to offer. Their extraordinary hats, scarves, belts, etc., really are part felt and fantasy. They are each unique creations that almost seem like something from a vivid dream. I love their use of colors and shapes. 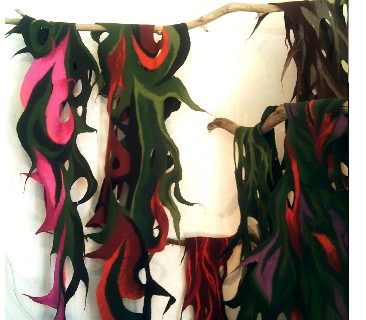 Please visit Feltasy's main website for more of their dreamy felted creations. Jane Bo (JaneBoFelt on Etsy) also makes a variety of felted creations. I first encountered her work through her blog. Unfortunately for me, it is all written in Russian, but I still enjoy looking at the stunningly gorgeous photos. The texture and color of her work are just splendid! Please visit Jane Bo's flickr account for more examples of her truly unique felted works. Thank you very much for such interesting selection of felt-artist and for featuring me! These items are absolutely fabulous! These are so awesome, inspires me immensely! Than you very much for sharing.